I’ve packed a hug by Chris Riddell. You never know when you might need one. It’s Daughter’s hug, so I suppose I’ll have to leave it with her. In fact, most of my packing is hers, despite me only taking cabin baggage for my Geneva weekend. Walking shoes. Heavy. Large. But they are needed for the Andes, so travel they must. As are the wrap-around sunglasses. It might be winter in Chile, but what if there is snow? That would be bright. Dayglow top. Yes, the sunglasses will come in handy there, too. She will be very visible in that top. More stuff. A few rags for me to wear. Two books for me; one for outward journey and one for the return. They’d better be good, as I have no room for just-in-case spares. The Covers of My Book Are Too Far Apart is a fun title, and the second time the penny dropped I decided it means that someone thinks the book is too thick, too many pages, too hard to read. Too hard even to consider starting to read. You know, some sort of excuse. We all have them. And Vivian knows them all. Probably heard all of us grumble at some point. Pink covers. Boys can’t read a book like that! Dyslexia. Can’t read at all. Too big for bedtime stories. I’m busy. Reading’s rubbish. Sounds pathetic, doesn’t it? And Vivian has ways round all of them. With Nigel’s pictures and her suggestions we find that ‘comics are cool,’ you can read while cooking, read a book about your favourite film, ask a librarian. If you want to read more of the same, that’s possible. Or something entirely different. Or re-reading a book again. There are LOTS of options. Really inspiring picture book, which should get nearly everyone reading. I know I’ve used this quote before, but the 2017 version runs ‘ if I build it, they will come.’ And how lucky that was, since it rained all day long. The day before was fine. I dare say today will also be fine. But as I said, we had built the new room, so not only was it spider-free and dry (i.e. no rain indoors, not no wine), but it was big enough to house another load of starved (well, why else would they come?) children’s authors, distaff side, whom I had optimistically invited to lunch. The Resident IT Consultant ran a [free] taxi service from and back to the station. I furnished him with descriptions of what people ought to look like. Which is a little hard when I hadn’t necessarily met them myself. These kind people arrived bearing chocolates, bottles, home baking and flowers. They really didn’t have to. But it is much appreciated. 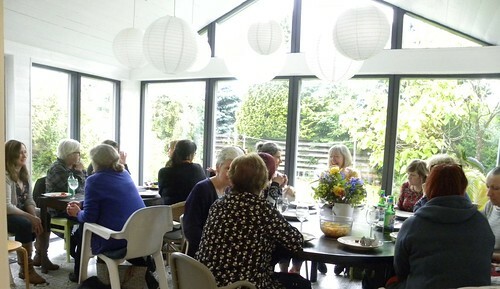 Whereas not only am I the kind of host who forgets to pour more tea or wine, but before most of the guests arrived I sat down and ate a pakora, or two, right in front of Helen Grant, who for technical reasons arrived early. I was hungry. And the Indian delivery service had sent more than I ordered. We talked about a lot of things, like how we prefer to hang socks when washed. Paired, colour-coded, neatly, or any old way. You can make new friends when you discover you share views on how to deal with socks. I added my thoughts on how to load the dishwasher. It seems there is something called Zombie running. And you might meet someone who wrote the books your children used to adore, causing a minor fan situation. At times (nearly the whole time, in fact) the sound levels rose so high it was virtually impossible to hear about socks, let alone anything else. Everyone’s secrets are perfectly safe. 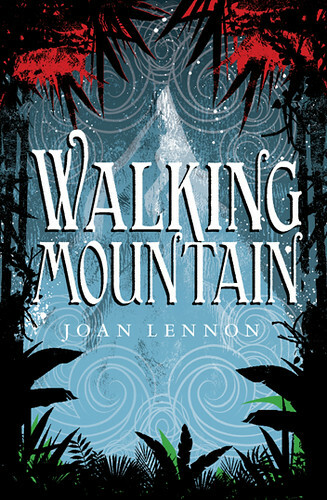 Joan Lennon’s Walking Mountain is one of the best books I’ve read in a long time. Right, I just needed to get that off my chest. Set somewhere where the Mountain has always moved away from the Sea, letting people have a little bit more land every time, now the Mountain has begun to move in the other direction. This is not good. Young Pema is chosen to tell the Women at the Abbey about it, but instead ends up walking to the Sea in the company of Singay, who’s always wanted to do something special, and Rose, a tiny silver man who’s a Driver of Comets. They have a world to save. This incredibly loveable trio meet many obstacles on the way, as you should in a good story. They deal with everything as best they can. Sometimes they meet nice friendly people and sometimes they don’t. I mean, they meet people who are truly awful, the way people sometimes are in good stories. The book is exciting in just the right way, and it is a perfect length at just under 300 pages. You just want to avoid having too many other things that need doing at the same time, because you will not want to be doing them. Whereas afterwards, you’ll feel happy and content and might even get round to doing a few chores. Would I be where I am today if it weren’t for Harry Potter? Would you? Reading the Guardian article about the fans who grew up with Harry, they were all very clued up, not to mention wearing great Pottery outfits. Offspring had to make do with what we could cobble together from our own clothes and a striped tie – in the wrong colours – bought from the neighbourhood charity shop. But that worked just as well as anything else. Daughter was Hermione twice in quick succession. And I always imagined Son would be the perfect Harry in the film. I’m so glad now he didn’t become rich and famous! From having to bribe Son to read the first book, to standing outside bookshops in the middle of the night, or being part of an event at the local stately mansion hired for book seven, in charge of what turned out to be quite hard quizzes and things. Daughter’s shock when Stephen Fry couldn’t keep up, and she actually had to actually read the fifth book because she couldn’t wait for the audio book. It became a way of life, almost. And people still refer to most things Harry Potter and expect the rest of the world to keep up and know what they mean. And to think I might not have read it had the Resident IT Consultant not bitten the bullet and gone first. The man didn’t even have the decency to tell me he thought it was ‘all right, I suppose.’ He simply put it down and reached for book two, which I’d already bought by then. My reasoning went that if he did that, maybe it would be worth my while having a second go. The Resident IT Consultant was so pleased with the way the local branch library looked this week, that he – almost – insisted there be a blog post about it. And you’re not tired of libraries, yet, are you? He volunteers to take other ladies out for walks. Not just ladies, but there are probably more of them than there are men. They are health walks, were people who need to get out are invited to walk in groups, led by volunteers such as the Resident IT Consultant. 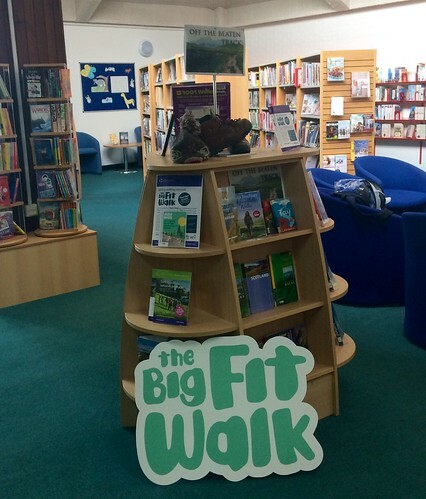 There was a drive this week to encourage more people to join, so the library, which is where they meet before the walks, was set up with books on walking and leaflets and badges. I believe there was even cake, which I suppose is the naughty opposite to exercise. The library was so keen on this sneaky way of bringing them more customers that they happily sourced books on walking and set up the display. All the Resident IT Consultant and his colleague had to do was look like fun company for the walks. And I believe he might have borrowed a book or two. It’s what he does. That and walking. Another thing I discovered at the library (see yesterday), was their section of beginners’ fiction in English. Well, that’s what they called it. I noticed the thin books in English by, among others, Bali Rai and Kevin Brooks on the shelves on the end of one of the sections. I didn’t recognise these books, so went closer, and realised that they were older Barrington Stoke titles. And yes, as such they are easier to read. Shorter and in a simpler language, and thereby ideal for the novice reader of English. We should have had books like that when I was at school! We got Somerset Maugham instead. Have no idea how popular they will be, now that impatient young readers tackle Harry Potter in the original, because they can’t wait. And I get the impression that having started, many young teens go on to read a lot more in English, because they’ve realised it’s possible. That they can. But for those who can’t, these dyslexia friendly books are just the thing.